Through the guise of a straightforward book-tour, the Krumple takes the audience on a nightmare journey inside the world of internet trolling. Inspired by true stories of online harassment, Norwegian folkloric trolls, and our own particular brand of lunacy, Do Not Feed the Trolls tells the story of Lisa Holloway, an ordinary girl who ventured onto the internet. 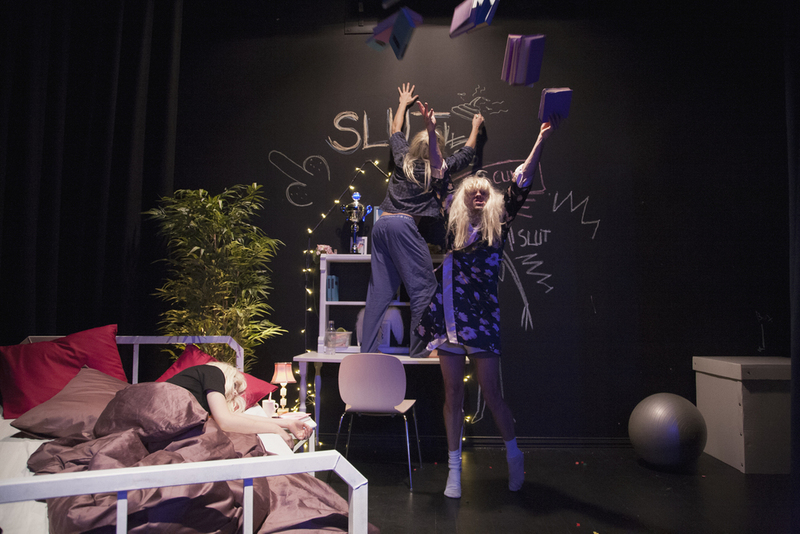 The show is a co-production with Scenekunst Østfold, which premiered at K60 in January 2016. 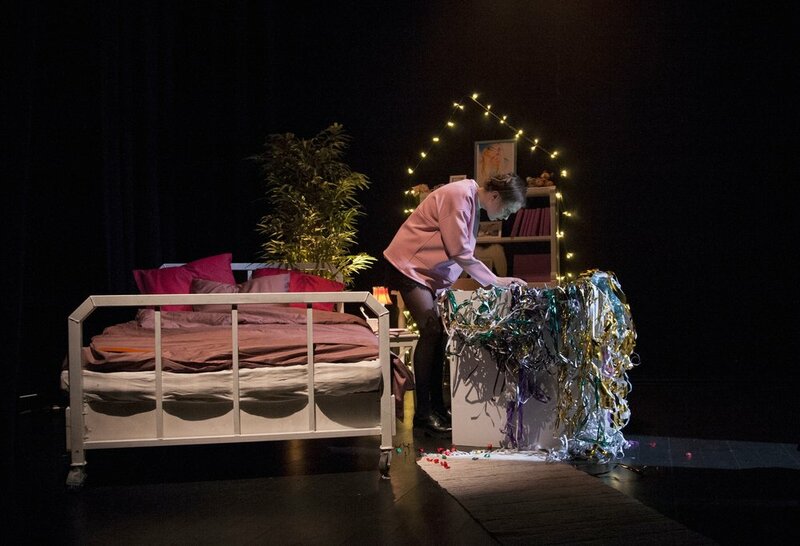 It was presented at Dramatikkens Hus in Oslo and at Sogn og Fjordane Teater spring 2016, at Théâtre Victor Hugo Bagneux in 2017, Markedet for Scenekunst in 2018 and in DKS Telemark, Sogn og Fjordane and Finnmark 2017-18. The show is currently touring through Den Kulturelle Skolesekken in Norway. See tour for more information. Writing, direction and performance by Jon Levin, Oda K. Nyfløtt, Vincent Vernerie and Jo Even Bjørke. Lighting design by Linn Sæther. Par le biais d’une vraie/fausse conférence autour de la parution de Do Not Feed the Trolls, le premier livre d’une jeune blogueuse, The Krumple entraîne le public dans un voyage cauchemardesque au coeur du trolling sur internet. Inspiré par de vraies témoignages de harcèlement en ligne superposées aux images des trolls du folklore norvégien, ce spectacle raconte l’histoire d’une jeune fille ordinaire confrontée aux délires et à la violence qui existent anonymement sur le net. 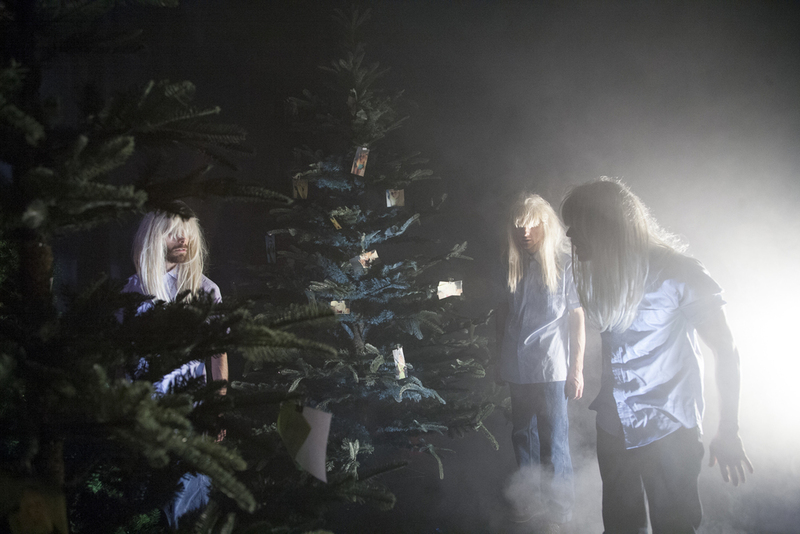 Do Not Feed the Trolls a été co-produit par le théâtre régional de Scenekunst Østfold, la première a eu lieu en janvier 2016 au K60, à Fredrikstad. Il a ensuite été présenté à Dramatikkens Hus à Oslo et au théâtre régional de Sogn og Fjordane (SoFT) en 2016 et au Théâtre Victor Hugo Bagneux en 2017. Il continue actuellement de tourner en Norvège. Pour plus d'infos, consultez la page Tournée. Créé par et avec les membres du Krumple: Oda K. Nyfløtt, Jon Levin, Vincent Vernerie et Jo Even Bjørke. Création lumière: Linn Sæther. "The dynamic play of the actors, carried by an inventive and playful staging, makes this extraordinary show a funny, scary and unforgiving chronicle of the online community. "A necessary and brave piece of theatre that deserves to tour France (...) One of the achievements of this play is that is able to materialize, thanks to a highly physical staging, the violence which infiltrates the rhizomes in the teenage brain." "Without moralizing, and with humour, intelligence and groundbreaking creativity, the audience is brought into a well-crafted and wholly realized universe. [Do Not Feed the Trolls] is extraordinarily vital and powerful, this is clearly the work of company that takes their work seriously and has their fingers on the pulse of the zeitgeist." 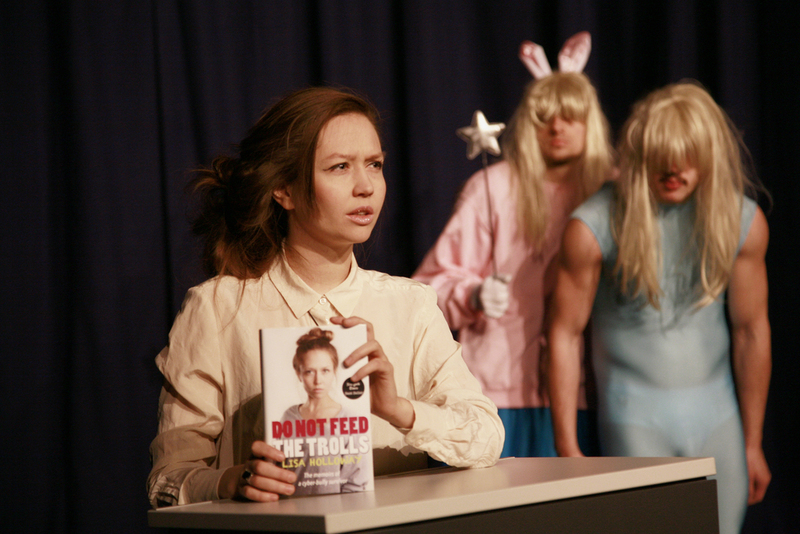 Do Not Feed the Trolls is part of Scenekunstbruket, the Norwegian Touring Network for the Performing Arts. Visit their external site for more information. Do Not Feed the Trolls fait partie de Scenekunstbruket, the Norwegian Touring Network for the Performing Arts. Visitez leur site pour plus d'information. Le spectacle a été créé avec le soutien du Conseil des Arts de Norvège, du Fund for Lyd og Bilde, du Fund for Performing Artists/FFUK, Scenekunst Østfold, Seanse et SPENN.